The city of Denver is confiscating electric scooters parked on public sidewalks, and charging hefty fines for repeat offenders. KUSA — KUSA – The city of Denver is cracking down on the electric scooters that basically appeared in the city overnight a few weeks ago… and now, it’s even starting to fine the companies that brought them here in the first place. That’s according to Nancy Kuhn, the spokesperson for Denver Public Works. She says as of Tuesday afternoon, the city has “removed” 264 Lime and Bird scooters from the public right of way. Those have been taken to Denver’s maintenance facilities and the companies that own them can come and get them, according to Kuhn. Kuhn says the companies also started receiving fines for poorly placed scooters earlier this week. The citations start at $150 per scooter, but could escalate to $500 to $999 if a scooter happens to be a repeat offender. If you’ve been following the saga of motorized scooters in Denver, it’s been a whirlwind few weeks. 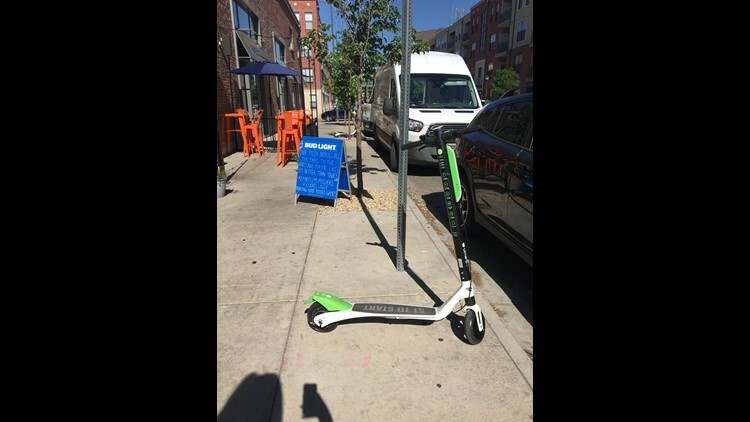 On June 1, Denver Public Works issued a release ordering companies to remove the scooters from right-of-way, and claimed that Lime didn’t ask for permission to drop them on the city’s sidewalks in the first place. This has prompted the city to explore new ways to regulate the scooters … but not before Bird, another scooter company, swooped in with their electric rides. Maybe this is the part of the story where we tell you the Denver Police Department confirmed that yes, you can get a DUI on a Lime scooter, so please scoot responsibly.